Underlayment is the layer of a roof beneath the roofing material and above the roof’s deck. Underlayment is an essential part of any roof – its main purpose being to provide an added seal and prevent leakage into your company’s building. While the underlayment is designed to keep water from penetrating your commercial roof, your building may require a breathable underlayment. A breathable underlayment would allow water vapour to escape from the roof deck. 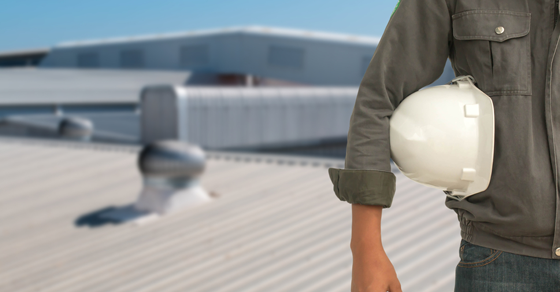 Without a breathable underlayment, moisture originating from inside a building could accumulate in the roof deck – potentially causing serious problems. Different types of underlayment materials vary in their breathability. An experienced roofing professional will be well equipped to determine the level of breathability that your roof requires. The main types of different materials out of which underlay can be made are tarpaper, roofing felt, and synthetic material. Each of these materials varies in durability, water-resistance and breathability. An experienced roofing professional will be able to help you determine which material is most suitable for you based on your budget, the age and structure of your building, and the material you plan to you to use on your roof’s most outer layer. Building codes in many jurisdictions contain specific provisions governing roofing underlay. For example, in Ontario, the installation of underlay is required by the Building Code in specific circumstances. As well, in some jurisdictions, a certain level of breathability in underlay may be required. A professional roofer should be familiar with the relevant building code provisions in order to ensure everything on your roof is up to code. Different types of underlay require different installation methods and the use of different types of fasteners to secure the roofs various layers. The manufacturers of underlay material will generally produce installations instructions – these should be followed closely to ensure the optimal durability and water resistance. Engineered synthetic roofing underlayment is designed to address the requirements for specific applications. For instance, the underlayment used under asphalt shingles requires different criteria from that used for a concrete or clay roof tile. Tile underlayment is typically exposed to a greater volume of water compared to composition shingle underlayment since the latter is the main waterproofing component within that type of roofing system. Metal roofing, on the other hand, demands an underlayment that is resistant to deterioration and has lower thermal bridging caused by exposure to temperature extremes. A slip-sheet may also be necessary for proper installation on metal roofs. Direct-deck tile or natural slate installation requires greater abrasion resistance than composition shingle or metal roofing. The most widely used engineered synthetic underlayment is that developed from polyolefin composition. It comprises woven polyolefin material coated on one or both sides with a polymeric material – combination or variation of polyethylene and polypropylene. The polymeric material is not laminated or even combined with asphalt or paper, resulting in the superior features for different roofing applications. It does not absorb moisture or break down when exposed to harsh chemicals or weather conditions. It has superior UV resistance, and will not rot or dry out. It is always easy to handle even in cold temperatures, yet it does not stretch, expand, or become slippery in hot conditions. It is superior to SBS and felt underlayment, and does not require plastic caps for installation since “tear off” resulting from high wind is practically eliminated. Engineered underlayment is up to 5 times lighter than type 30 felt. This means that it can be rolled in larger dimensions for improved coverage and safer installation. It is also more cost effective to ship and transport. Some polymeric underlayment have chemical coatings that offer slip-resistance, while other designs feature woven textures that don’t need extra coatings to make them slip resistant, plus they offer improved recyclability. Engineered synthetic underlayment can be produced in a wide range of dimensions depending on the capability of the manufacturer. For instance, while standard felt is available in up to 36-inch rolls, synthetic underlay can be produced in up to 54-inch rolls. This is necessary to boost insulation value and cushion for stacking clay and concrete tiles during installation, as well as to guard against thermal bridging for metal roof applications. If you’re looking to equip your commercial building with proper underlayment, contact Empire Roofing today!